The most common question? Cost. Whether vinyl liner or concrete or fiberglass pools, whether extravagant or minimalistic aesthetics, people want to know about how much they're going to spend. Most vinyl liner pools cost $35,000–$65,000 upfront and $11,500 in maintenance over 10 years. Concrete pools run $50,000–$100,000 upfront and $27,400 over 10 years. Fiberglass pools cost $45,000–$85,000 upfront and only $3,760 in maintenance over 10 years. How much does a vinyl liner pool cost? Most vinyl liner pools cost $35,000–$65,000 upfront. Unfortunately, the lower initial cost usually leads to the liner pool looking like it didn't cost much. Upgrading to a more sophisticated aesthetic puts the pool project closer to the cost of a fiberglass pool. Vinyl liner pools cost about $11,500 in maintenance over 10 years. The average vinyl liner must be replaced every 5–9 years. This costs about $4,500 each time—paying for the labor and materials to replace the liner, the water to fill the pool, and the chemicals to start the pool back up. Vinyl liner pools require less electricity and fewer chemicals than concrete pools. However, algae can still take hold in niches, seams, and corners with no circulation. The weekly maintenance will cost about $7,000 over a 10-year period. Concrete pools generally cost $50,000–$100,000 upfront. Concrete pool maintenance will cost about $27,400 over 10 years. The super-porous surface of a concrete pool needs a lot of help to avoid algae. Like, a lot of help. This means two things for a concrete pool owner: using more chemicals and running the pump and filter longer. Goodbye, $11,500. A lot of concrete pool owners hire a pool cleaning service to take care of the weekly maintenance. It saves them the effort but adds up to about $500 per season. Every 3–5 years, a professional should acid wash a concrete pool. This penetrates the pores of the plaster, killing algae and removing stains. It can cost anywhere from $200 to $900 depending on your pool size and location. Concrete pools typically have to be replastered every 8–12 years. You'll probably need to replace the waterline tile at the same time. This repair usually costs $6,000–$10,000. For more details on budgeting for a concrete pool: How Much Does a Concrete Pool Cost? Fiberglass pools cost $45,000–$85,000 upfront. Ask your pool contractor what the standard package includes. The base package can vary greatly from company to company. It surprises me how often a company's base package price excludes permits, delivery fees, water, etc. 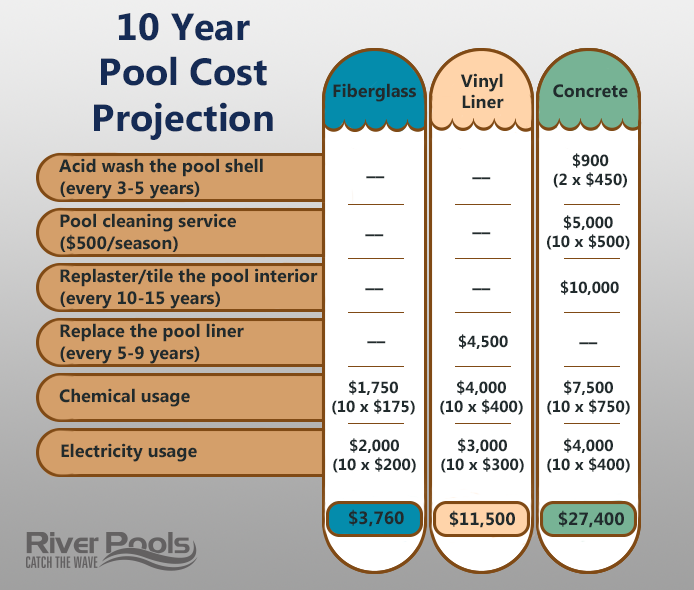 A fiberglass pool only costs about $3,760 in maintenance over 10 years. The gelcoat surface is nonporous, meaning algae has no place to take hold. Nice! You use fewer chemicals, spend less time maintaining the pool, and can run the pump and filter in shorter cycles or at lower speeds. A properly manufactured and maintained gelcoat should never need to be resurfaced. For more details on budgeting for a fiberglass pool: How Much Does a Fiberglass Pool Cost? 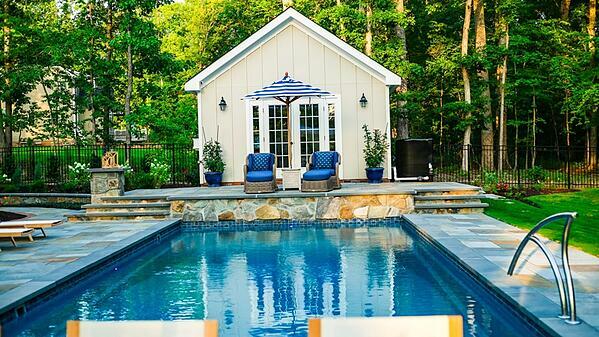 Want to learn more about buying your perfect inground pool? Price matters. Oh, does it matter. But it's not the only thing you have to consider when you're pool shopping. After all, this isn't a car or a camper. You can't trade it in later—it's gonna be with you for a good, long time. To ensure you're getting the best pool for your needs, compare all aspects of the three types. 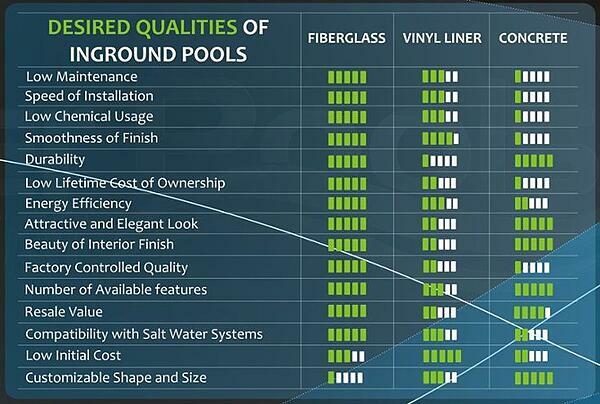 Fiberglass pool shapes and sizes are less customized than concrete pools or vinyl liner pools. However, most people can find a model that fits their needs. They’re super durable, low-maintenance, and beautiful! Plus, bonus: they have the lowest long-term costs of all three types. At River Pools we manufacture and install fiberglass pools in Virginia and Maryland. Our pools are also available in other areas of the country through our dealers. Read through our ebook about the three pool types, and get in touch with us to see if fiberglass might be the right choice for you. Editor's note: This blog article was updated on February 25, 2019.